For many people the thought of spending time alone is not a pleasant thought. But when we spend time alone it gives us the opportunity to know ourselves instead of shaping ourselves to the desire of others. Knowing your authentic self attracts people that want to be around you because of who you are. Know yourself…enjoy yourself…then others will, too. This entry was posted in Advice, Authentic Self, Awen Therapy, Change, Jay Blevins, MFT, Oscar Wilde, Psychotherapy, Therapy, Time Alone and tagged Advice, Authentic Self, Authenticity, Awen Therapy, Jay Blevins, JSJ Therapy, MFT, Oscar Wilde, Time Alone. Bookmark the permalink. 1 Response to Thought for the week. This is so true. 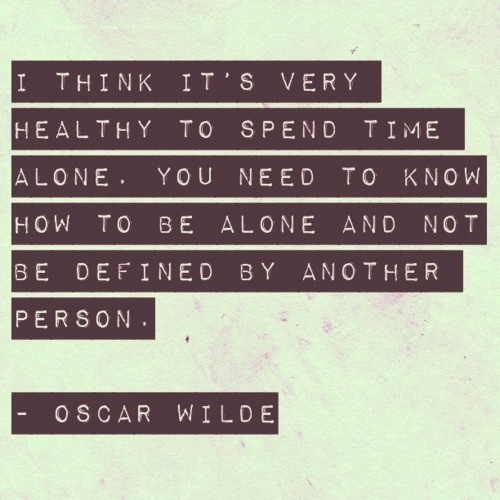 Many people cannot spend time alone. Writing is a very solitary activity, as writers we have to be alone.